Google’s Chrome OS is absolutely obliterating Windows in the classroom right now, to the point where Microsoft had to build a new lightweight version of its Windows 10 operating system. This way, Windows computer makers can offer lower-cost laptops aimed at the education market. Google-powered Chromebooks still have the momentum though, and it remains to be seen whether or not Microsoft’s Windows 10 S will slow Chrome down. Of course, Chromebooks are great outside the classroom as well. Chrome is so much faster than Windows, and it’s perfect for emails, web browsing, video streaming, and plenty more. 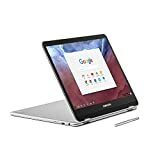 If you’re looking for a powerful Chromebook that’s still affordable compared to comparable Windows notebooks, definitely check out the Samsung Chromebook Plus Convertible Touch Laptop, which is on sale right now on Amazon. This Device comes with the pen out of the box. Power to personalize your communications by writing directly on screen.